There are two classes of traditional Japanese knife forging methods: Honyaki and Kasumi. are made out of two materials and are easier to forge and maintain. Kasumi are made from two materials, like samurai swords: high-carbon steel and soft iron forged together (known as san mai blades), with the steel forming the blade's edge and the iron forming the blade's body and spine. The class is based on the method and material used in forging the knife. Honyaki and kasumi knives can be forged out of steel. Based on their kirenaga (duration of sharpness) and hardness, however they are more difficult to use and maintain. Additionally, there are high-grade quality kasumi knives called hongasumi and layered-steel kasumi called Damascus that have longer kirenaga. Originally, all Japanese kitchen knives were made from the same carbon steel as katana. More expensive Warikomi or san mai knives have a similar quality, containing an inner core of hard and brittle carbon steel, with a thick layer of soft and more ductile steel sandwiched around the core so that the hard steel is exposed only at the cutting edge. Nowadays stainless steel is often used for Japanese kitchen knives, and Warikomi or san mai laminated blade construction is used in more expensive blades to add corrosion resistance while maintaining strength and durability. The materials used to make Japanese knives can be grouped into twocategories. 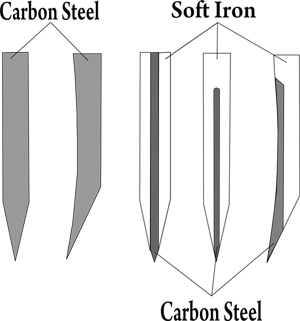 One is carbons steel, a material used in monst Japanese knives. Carbon steel is made in the forge by adding carbon to steel made from iron sand. 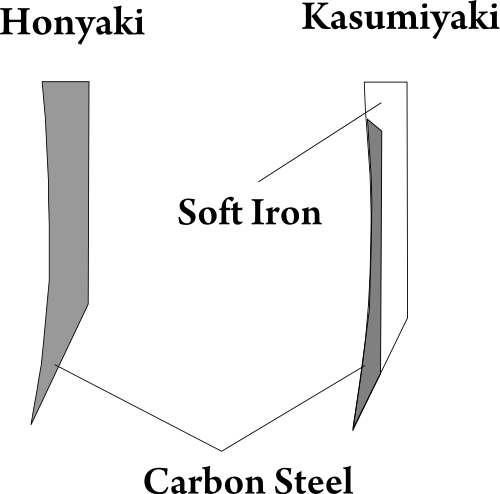 Honyaki are made completely of carbon steel, while Awase (Kasumi / Warikomi) are made by combining carbon steel and softer iron. The second category of materials includes stainless steel. To make stainless steel, chrome (more than 12%) is added to carbon steel. Because this prevents rusting, stainless steel is used in both Japanese and Western knives made for home use. Japanese kitchen knives used to be forged from Tamahagane Japan Steel, which is a carbon steel mad using the ancient Tatara blast furnace method. However, these days the main material is Yasuki Steel. Yasuki Steel, which has a high carbon content, was invented by Hitachi Metals Ltd. using the ideas behind tatara blast-furnace methods to create steel that could be mass-produced. Yasuki Steel is the top quality steel for forging.